On Saturday, I braved a suburban mall. I had a birthday present to buy for a sweet niece who is turning six and, like many six year olds, she is obsessed with American Girl. I have boys so I know very little about American Girl, but I have heard stories of this mythical place where there is a hair salon and even a hospital – for dolls. I wish I could have seen my own face when I walked in to that store. Girl overload. If I had walked into that same space and it had been filled to the brim with boys and construction vehicles, I probably would not have batted an eye. I have two brothers and two boys – I get boys. It’s not as though I am, or ever was, a tomboy. I’m pretty girly as a matter of fact and if I had a girl, chances are we would have already gotten a couple of doll manicures at American Girl. Alas, I was overwhelmed, intimidated, and I had two boys who were initially in awe of that place but soon were like “get me out of here!” I flagged down a salesperson and had her help me with decisions about doll pajamas and five minutes later, we were out. We took a long walk through the mall to get back to our car and I was miffed. Annoyed. Disturbed. Not by the doll experience but by the fact that there were Christmas decorations everywhere. I’ve said it before – I love Christmas as much as the next person, but it’s not Christmas time yet. Not in the States at any rate. Let’s enjoy the holiday that is almost upon us. Let’s savor autumn before winter comes. 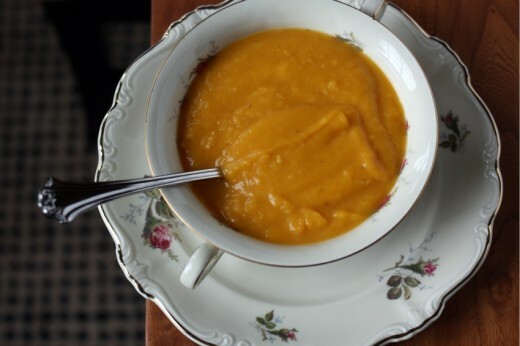 Let’s enjoy our Butternut Squash Soup before the trifles and fruitcakes and sticky toffee puddings arrive. 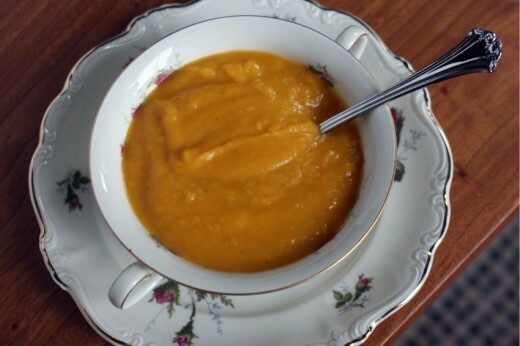 I love butternut squash soup and I have tried many in my day. I’ve even posted a very good one here. But this is my favorite and one I have been making for a long time. 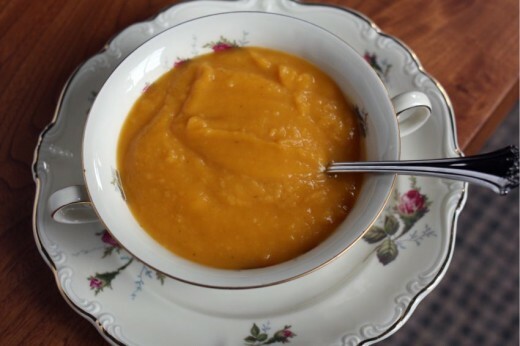 Ginger and squash were made for each other and just a bit of cinnamon stick simmered in the pot makes all the difference. This is a very simple recipe that uses squash to its best advantage – roasted in the oven. To the well-loved original recipe, I’ve added just a touch of cream to round out the flavors and a squeeze of lemon to wake everything up a bit. I have a very good immersion blender and was able to get a really nice smooth texture with it but if you don’t, blend it carefully, in batches, either in a blender or a food processor. I have four tips for you. 1. Like most soups, this one tastes great the next day. It will be fairly thick, so you can add a bit of water, broth, or even cream to smooth it out if you wish. 2. The easiest way to cut the squash here is to cut off a bit of both ends and then stand the squash it up on its base end. Using a large sharp knife, cut straight down the center. This way, you aren’t battling with a rolling squash and you also have gravity on your side. 3. Roast the seeds! Rinse them well, allow them to air dry, toss them with a bit of olive oil and salt, then roast them in a 375º oven (same temp as the squash!) until they are golden. Garnish the soup with them, they provide a lovely crunchy contrast. 4. Don’t forget to remove the cinnamon stick before you use your immersion blender. Ahem. Preheat the oven to 375ºF. Drizzle the cut side of the squash with a bit of olive oil, then sprinkle with a large pinch of salt and a few grinds of pepper. Place cut side down on a large baking sheet and bake until squash is very soft, about 50 minutes. Allow to cool enough to touch, then peel the squash using a paring knife, or just your fingers. Roughly chop the squash. Place a soup pot over medium heat. Drizzle in just enough olive oil to coat the bottom, then add the onion and a large pinch of salt. Cook for five minutes, then add the brown sugar, ginger, garlic, and cinnamon. Cook for another five minutes, then add the squash and vegetable broth. Bring to boil. Reduce heat to medium-low. Cover and simmer for 10 minutes. Discard cinnamon stick. Purée the soup either using a blender, food processor, or immersion blender. Once the soup is back in the pot, turn the heat on low and pour in the cream and the lemon juice. Season to taste with salt and pepper. I agree–one holiday at a time, please! Even though I’ll probably start baking Christmas cookies on Monday–it will be after Thanksgiving. Ginger and squash are lovely together, and next time I roast a squash I have to take the time to use the seeds. Happy Thanksgiving, Dana! I’m so not ready for Christmas either…can’t we just enjoy our pumpkin pie and quadruple layer sweet potato cakes? I can understand you not enjoying Christmas infringing on Thanksgiving, though in Canada ours is in October so it’s more like Christmas infringing on Halloween! This sounds like a perfect fall soup. I hear you about Christmas coming too soon and I’m Canadian too so our Thanksgiving is long past. I think our stores need to wait until at least after Nov 11th (remembrance day) to get Christmasy. I get annoyed for you when Christmas specials air on TV two days prior to your Thanksgiving. And now it seems as though Black Friday is encroaching on Thanksgiving with stores opening at midnight. I hope you had a lovely Thanksgiving and enjoyed fall and this lovely soup.